We are having a small wedding after 25 years of marriage. We never could afford one and this is the perfect time to have one for family/friends that impacted us through the years. My colors are silver and white and blue. What other could/should I incorporate to break the blah. Well first let me say congratulations on such a milestone event! 25 years is a BIG deal! With that said I would let the Silver be your dominate color since it truly signifies the 25 year bench mark. Use blue and white as your accent colors, and try to think of other unique ways to make your day stand out. Have some fun with the theme and allow your guests to walk down memory lane by having pictures from 25 years ago of them with you both framed in silver around your reception or at the tables. Have someone taking photos of them with you NOW so you can have them printed out and framed as a gift as a remembrance or wedding favor. 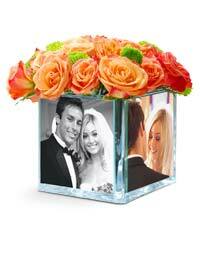 Glass Photo Cube Vase (photo above). You can also have a signature drink – 25 Years of “Good Times” Cocktail - and make it the drink that you both have enjoyed the most over the years. Finally I would not forget to say a few chosen words to let your guests know how much they have meant to you both over the last 25 years, and toast to the next 25. Even open up the mic for your friends to share in their fondest memories over the years too. Make your own life time more easy take the loan and all you need. On completion of your 25 years of marriage we, the whole team of custom writing service congratulates you and pray that you complete 25 more years the same way, happily..